The holidays are upon us! It’s a time for family, fun and, an American absolute favorite… Pie! From blueberry, to apple, to pecan, there is a perfect pie for every person on this planet. I understand that it can be difficult to get everyone’s favorite on the table though, so let us take a moment to check out a little pie science and prepare you for some party pleasers. In this article from Live Science, a trusted source because it has science in the name, we can see that according to Schwans (the makers of Mrs. Smith’s pie products) Apple seems to dominate as a sure fire taste bud pleaser. Pumpkin comes in at a reasonable second. Poor Peach takes last place at just 16%. It is worth noting that the numbers in this chart from this “trusted science source” add up to 271%. That said, don’t get too upset if you are a Pumpkin fan. 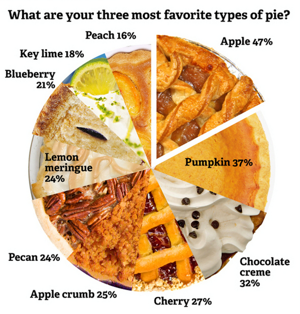 According to the America Pie Council, at piecouncil.org (yes that is a real website, they even sell merchandise) 19% of Americans prefer Apple Pie over 13% Pumpkin. 12% are die-hard Pecan lovers. The numbers that the APC (that’s what they call themselves) provides do indeed add up to a round 100%, so I believe these numbers can be taken slightly more seriously. Overall however, both studies show that Apple and Pecan seem like good options for guaranteed success. Now for some interesting facts about pie, brought to you by, the American Pie Council. · It was once against the law to serve ice cream with pie in Kansas. · 7% of Americans admit to having passed off a store made pie as their own. · In 2006, Key Lime Pie was voted the official state pie of Florida. · 113 million Americans have eaten pie for breakfast (I have no idea how they asked all of us). · If you love Apple Pie you are thoughtful, realistic and compassionate. · 6 million American men age 35-54 have eaten the last slice of pie and denied it. All of this to say, whether you are on team Apple, team Pumpkin or team Pecan, TonyDavidsHomes is cheering your delicious holiday pie on, all the way to the dinner table. From my family to yours, Happy Thanksgiving! The smart speaker market has boomed massively in the last 18 months. Google released a smart speaker with its own voice assistant built in. 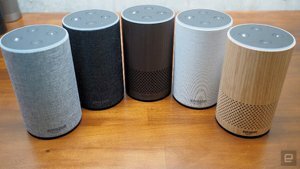 Amazon has two versions of it’s Echo and recently released it’s G2 model with great exterior style options. Sonos offers One, and Apple’s Siri-controlled HomePod will likely be a hot new item this holiday season. Other options are available too and the competition keeps growing. It looks like this latest technology trend is fully underway! But what exactly is a smart speaker? What can you do with it, and should you buy one? What are they? Let’s keep this definition simple. Smart speakers are wireless speakers with voice control and artificial intelligence built in. They are a type of voice controlled personal assistant capable of responding to a wide array of voice commands and questions. Oddly enough, one might be tempted to say that a bit of personality may have been built into these devices too! More on that later. What can you do with a smart speaker? Lots of things! Typical uses in our house are, “Alexa, what’s today’s weather?” “Alexa, set a timer for 20 minutes.” “Alexa, kitchen lights on.” "Alexa, order a pizza.” And, when there are little ones in the house, the most popular one is, “Alexa, tell me a joke.” Of course, there are hundreds of other options too, like book an Uber, create a shopping or to-do list, answer trivia questions, and more. The device is word triggered. All you have to do is say the magic word (In our case it’s “Alexa” with the Amazon Echo) and your smart speaker will wait to hear the rest of your command. The devices currently on the market vary with the AI built into it so depending on which one you purchase, they will work in slightly different ways with different apps and services. A popular use for smart speakers is streaming music via Bluetooth, AirPlay and/or wi-fi. Often, when we can’t decide what type of music we want to listen to, we let our smart speaker choose for us. We speak the command, “Alexa, play something good.” And, based on our past music choices, Alexa will (almost) always make a better choice than we would have if we’d done it ourselves. But, there was this one time (and here’s where the personality mentioned above comes to play) when Alexa responded with “I can’t find any good music.” We were pretty surprised to hear that answer, and as a joke we asked her if she was in a bad mood. She replied, “I think I am.” Okay, that was a little creepy! Should you buy one? For the price of the device along with its many uses, the answer is a definite yes! It doesn’t take long for your smart speaker to become engrained into your daily routine making your life more convenient and entertaining. If you’re looking for a new home in Central Florida to fill with gadgets like smart speakers, give me a call. All you need to say is, “Tony, find me a new home.”, and I will! Buying a home can be a thrilling experience. You will have a home of your own, you will be starting a new chapter of your life and you will be ready and excited to get settled. Before you can get settled though, you need to stop and consider your mortgage interest rate. I know, not a very fun subject right? Well, I can’t promise I can make it fun, but today we are going to touch on some important factors that will help you understand what causes fluctuations in mortgages rates and what can help you determine the best time to buy. Although mortgages are generally packaged as 30-year products, the average mortgage is paid off or refinanced within ten years. Due to this trend, the movement of the 10-year Treasury bond yield is said to be one of the best indicators of whether mortgage rates will rise or fall. So what can you do to check on these trends yourself? Check out finance sites such as Yahoo Finance to get a glimpse of what is going on. If the 10-year bond rates are moving up, then mortgage rates are probably moving up as well. If the 10-year bond rates are moving down, chances are mortgage rates are too. Make sure that when you check this out you look at bond yields, not bond prices. These are two different things. Bond yields can predict interest rates. If you already read the news every morning, then this is a simple step you can take to keep yourself in the know. You know that tab, “Financial News” that most people avoid on their news homepage? Yes, I know it to. Somedays it’s tempting to skip over it and go straight to technology, entertainment, sports or health. Truth be told though; this tab is exceptionally useful for getting a decent prediction of mortgage rates. The guideline is simple. Negative economic news brings with it lower mortgage rates. So while the news may be disappointing, yay for mortgage rates! Contrarily, good economic news usually means higher interest rates. Check out stocks, job reports, home sales and gross domestic products. Overall, a growing economy is also a sign of growing mortgage rates. 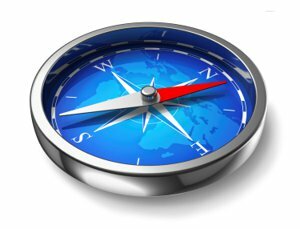 Armed and ready with your mortgage rate compass you can get an idea how to navigate the ebb and flow of mortgage rates. Okay, so when I said “Winter” gardening in Florida you might have laughed out loud. Winter is a relative term here in Central Florida. While we don’t experience a winter as intense as our Midwest friends, we do still have an ever so slight change of seasons. The best part of our mild climate is that we can continue our gardens in the winter with just a subtle change of pallet. 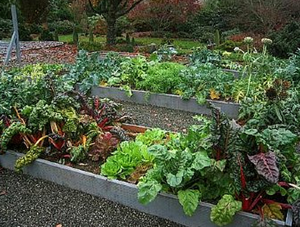 Let’s talk about how to re-sow your garden for a great Florida Winter harvest. Florida winter is much like the rest of the countries fall in terms of average temperatures and fall is a great season for gardening, especially edible gardens. Have you ever grown your own food? If you haven’t here is your chance. Caution, this habit can be addictive and in Florida it’s an addiction that can be fed all year round. Prepare your plot. This is a new gardening season. Take out any old plants and compost or harvest them as appropriate. Weed your garden space completely. Add fresh soil or compost and mix your soil to aerate your garden. If you are into it, drop some earthworms into your garden to keep it fresh. In Florida earthworms can survive all year round with the warmer temperatures and moist climate. Plan your garden. Fall veggies in most US climates qualify as winter veggies in Central Florida. Here’s a great list of options you might want to consider for planting this “winter” season. Maintain your garden. Each plant will need different care. Make sure you read all of the directions and ask your local gardening expert if you have any questions. Make sure each plant has the right amount of room, sun, and water. Harvest and enjoy. When your garden succeeds (which it will) you’ll get to enjoy the fruits (or vegetables) of your labor. As your seeds are growing start looking into recipes you can use with what you’ve grown. You will be amazed at the huge taste difference in what you grow yourself compared to what you buy at the store. Make sure you grow your family’s favorites to guarantee your garden is a hit! Once you’ve decided to sell your home your life is about to get a whole lot more entertaining. You are going to have a lot of things to juggle, but before the show can start, you are going to need to set the scene. Don’t worry, TonyDavidsHomes is skilled when it comes to staging and we are here to help you through the process from initial stage design all the way to the final curtain call. Good staging sells a home faster. While you may not be convinced that furniture feng shui is the perfect solution to your inner peace, trust us, it is the solution to selling your home (which could lead to inner peace). 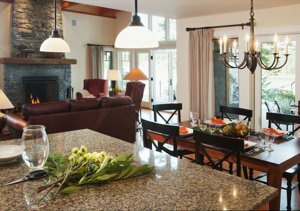 Depending on the state of your home, you may have different types of staging to tackle. Today let’s talk about how you can make your house feel like your buyers home. Remove clutter on counters, shelves and furniture. While you clean up shelves take a moment to depersonalize as well. Buyers can picture themselves in your home better when they aren’t looking at pictures of your kids. Keep the size of each room in mind when staging. Even if you love the kitchen table, if it takes up too much space you should consider a short-term replacement. Big furniture can makes a room look smaller, and this may or may not be what you are hoping to achieve. You know that laundry list of repairs that you've been ignoring? Now is the time to tackle it. Fix broken cabinets, brush up rough paint spots and remedy any eyesores. If you have any boldly colored walls paint them a more neutral color that appeals to a wider taste range. Don’t neglect your exterior. Trim the hedges, mow the grass and make sure your front walk is inviting. A little bit of elbow grease can work wonders. Let’s face it, everyone wants to move into a clean home. Make sure your kitchen and bathrooms are spotless. Buyers immediately associate these two rooms with the cleanliness of the whole home. Put out fresh linens and consider lighting a scented candle or air freshener to make sure your home smells as clean as it looks. Well-lit homes are warm and inviting. Clean your windows thoroughly and you may be surprised how much more light flows into your space. In rooms lacking light invest in a lamp or new light fixture. Make sure everything visible is clean and in immaculate shape, including furniture and appliances that are not being sold with the house. Well cared for goods indicate that the homeowner also takes care of the house. Think of the potential buyers as an audience. Will they be wowed with your home or will they leave disappointed? If your audience comes back for an encore performance, chances are your staging could bring them all the way to the signing table. Looking to sell? Call or email me today so we can set the stage for a quick sale. With fall in full swing and Halloween just around the corner, the fun in Celebration is really gearing up! While the Celebration Town Center hosts events all year long, there’s something special about the events of this coming weekend. On Friday, October 20th the weekend fun kicks off at 5:00 PM with Celebration’s annual Octoberfest. This family-friendly event is celebrated in the old-world German tradition featuring the sounds of Dan Witucki & Heimatland Musikanten. The entertaining (and sometimes comical) live, interactive show will have you singing along and giving it your best to yodel like a pro! Come hungry and sample some traditional Octoberfest foods and brews. Don your lederhosen, arrive early, and stay late! But not too late, because you’ll want to get up early on Saturday as the fun in Celebration continues. 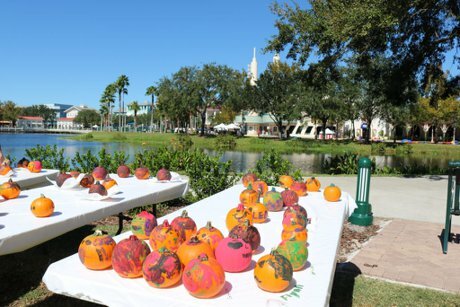 Head back over on Saturday for a full day of fun at Celebration’s Fall Festival. Make sure you and your little ones are wearing your Halloween best to get the most out of the day. Arrive at 11:00 when the event starts to make sure you have time to enjoy all the fun! The day is just jam packed with family fun including pony rides, bounce houses, arts and crafts, face painting, costume contests, pumpkin decorating, a petting zoo, a mechanical bull, DJ Joe Magic, Food Trucks, and two performances of high energy Celtic music by Off Kilter. Each day ends with Celebration’s own falling leaves on Market Street. Leaves fall twice each evening at 7:00 PM and again at 9:00 PM. If all this action isn’t really your thing, there are still plenty of options in town for you to enjoy. Take advantage of the beautiful walking trails that wind throughout the community of Celebration. Or, relax on one of the many rocking chairs with views of the sparkling lake. Don’t forget the amazing dining and shopping options in town too! As with all events in Celebration, parking and admission are free! Inspecting the physical condition of a house is an important part of the home-buying process. Most buyers make the home purchase contingent on the satisfactory result of the home inspection. A professional inspector will carefully comb through the house inspecting all major house systems from top to bottom. The inspection will include the roof, plumbing, electrical and heating systems, foundation, and drainage along with many other less critical aspects of the structure. Depending on the location, size, age and type of home an inspection will take (on average) two to four hours to complete at a cost of $250.00 and up. Larger homes with multiple structures on the property will take longer and have higher inspection costs, as will homes with swimming pools. Accompanying the inspector during the home examination is a great opportunity for the buyer to learn about various functions of the home and gather some great maintenance tips for later on down the line. The buyer will receive a detailed report of the inspection results. It’s wise to go over the report with the inspector and ask questions to fully understand any major issues that are noted. In addition to the general inspection, hire a licensed structural pest control inspector, who will create a special pest report on the property identifying any infestation by wood-boring insects such as termites and flying beetles. This type of inspection will also reveal evidence of wood rot or fungal conditions. With an inspection contingency in your contract, if the inspections bring problems to light, you have the opportunity to negotiate with the seller for repair work or perhaps a lower price for the home. If negotiations such as these are not possible, the contingency protects you from having to move forward on the purchase of a home that may have more problems than you are ready to take on. At TonyDavidsHomes, we’ve can provide you with excellent resources for home inspections. If you’re in the market for a new home, give me a call or email me today and we can discuss the process and how I will work on your behalf to make your purchase seamless! Six months ago, the mismatch between the type of inventory of homes for sale and the demand of buyers in the US was causing the formation of two markets. 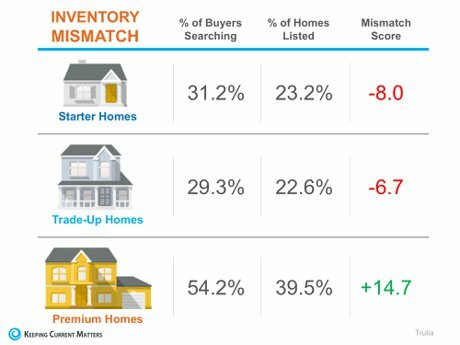 In the starter and trade-up homes categories, there were significantly more buyers than there were homes for sale, causing a seller’s market. In the premium, or luxury home category, the opposite was true as there was a surplus of these homes compared to the buyers that were out searching for their dream homes, therefore creating a buyer’s market. According to the National Association of Realtors, the inventory of existing homes for sale in today’s market is at a 4.2-month supply. Inventory is currently 6.5% lower than this time last year, marking the 27th consecutive month of year-over-year decreases. Nationally, buyers searching for starter and trade-up homes and are coming up short. Premium homebuyers, on the other hand, have the best chance of less competition and more inventory of listings in their price range with a 14.7 point surplus, which is creating more of a buyer’s market. If you are thinking about buying OR selling in Central Florida this Fall, give me a call or send me an email to discuss your scenario. 407-922-9011 | info@TonyDavidsHomes.com. There’s no need to go crazy. Adding a few simple items to three key areas can give you just the change you’re looking for. 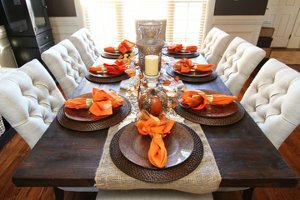 You can easily add some fall flair to your dining room table with a splash of orange. Orange napkins with a few coordinating pumpkins and candles will do the trick. If you want a more rustic look, add some burlap or other naturally colored, textured elements. A focal point of many living rooms is the fireplace. 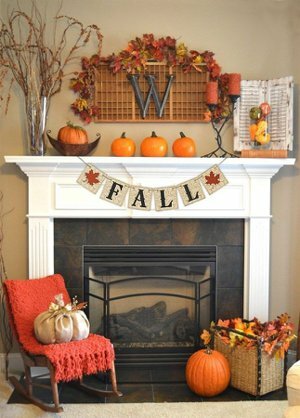 Dressing up your mantle for the season is the perfect way to cozy up the atmosphere for the fall. Add fall-colored blooms, pine cones, or candles to the mantel. Drape natural and seasonal garlands along the mantel to add to the affect. Add additional warmth to the room with a few cozy throws and pillows. Mixed textures will provide the most impact. 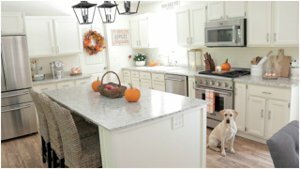 Kitchens tend to be the primary gathering space for families and it’s another great place to add a touch of fall. You’ll want to add a few accents in the right places ensuring that they are not diminishing the functionality of the space. Natural elements are a welcome touch. Add pine cones, gourds, and small pumpkins to a wooden bowl or a basket on the center island. Add a fall wreath to your pantry door. For a particularly celebratory look, display copper mugs or vintage glassware. Celebration is a popular destination all year round. The gorgeous town offers fine dining, shopping, peaceful walking trails, and special events throughout the year. October is jam packed with fall events guaranteed to be fun for everyone. Here’s the lowdown on what’s happening and when. Need stuff? Then head over to Celebration for this huge community sale and be prepared to be amazed! This community wide event is sure to turn up that treasure you’ve been searching for! Traffic builds as the day progresses, so plan to arrive early. Bring your lawn chairs, blankets, snacks, and insect repellant and find your perfect spot on the great lawn at Lakeside Park. Enjoy this fun and timely Tim Burton film under the beautiful October stars! Showtime is 7:30 sharp. Calling all foodies! Enjoy the sights and sounds of DJ Joe Magic along with the culinary delights of many of Central Florida’s most popular food trucks. The event runs from 5:00 to 9:00 PM. On October 20th and 21st, Celebration Town Center transforms before your very eyes as the falling leaves of the season drop on Market Street in the Fall festival known as Oktoberfest. Listen for the rustling of leaves, relax by the lakeside and rock your troubles away, and enjoy the live music with family and friends in this one-of-a-kind themed extravaganza. Leaves fall daily at 7, 8, and 9 PM. Held annually in picturesque Lakeside Park, this festival is arguably the most fun event of the month. 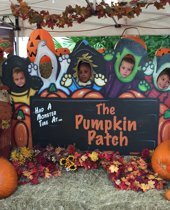 Mark your calendar and come to enjoy the ‘crisp’ autumn air at the annual Fall Festival. Events begin at 11:00 AM and include a bird show, costume contest, live performances, pumpkin decorating, petting zoo, bounce houses, face painting, and lots of great food and drink! October 31st – Trick or Treat! You’d be hard pressed to find a better place than Celebration to bring the little one’s trick-or-treating. Beyond the door-to-door candy collecting, homeowners go over the top to decorate and transform the town in the true spirit of this fun family holiday. Come visit our town and get a glimpse into why we love to live here! If you, or anyone you know, are interested in learning more about living in Celebration give me a call at 407-922-9011. I’d be honored to show you around.